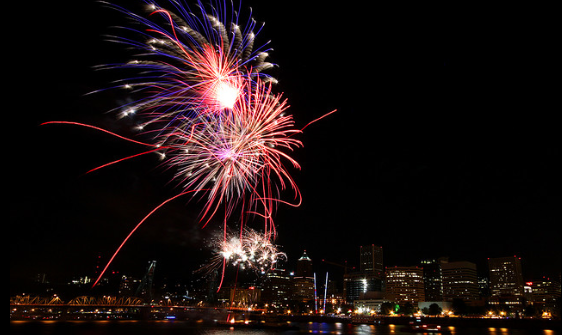 Fireworks, floating, and family diversions are plentiful over the Fourth of July long weekend. We're fast approaching Independence Day (the holiday, not the Will Smith movie) with all of its attendant activities and anxieties (e.g., dogs hate fireworks—or at least mine do). In order to maximize a precious day(s) off from work, we've assembled a list of holiday happenings for your consideration. Feeling social? Don't mind crowds? Then the annual Waterfront Blues Festival is your ticket. Not only is the lineup for this year hotter than a Roman Candle corsage (Robert Plant, Mavis Staples, Too Slim & the Taildraggers, MarchFourth Marching Band, Joe Louis Walker), but when the sun sets on the horizon the sky will glow with a patriotic pyrotechnics display and Portland R&B diva Linda Hornbuckle will lead the crowd in a suitably soulful rendition of the National Anthem. For more, check out our Festival Field Guide from our Summer Guide. The combination of rides, refreshments, and rockets available at Oaks Park can't be beat if your goal is to run the young 'uns till they drop. There are picnic spaces (first come, first serve), all-day live entertainment from the Comcast stage, thrill rides, and, considering admission is only $2 for anyone under 16, it's a day out that won't require the platinum card. Fireworks begin at dusk. For a full day itinerary, see our Summer Fun for the Family on $50. The Fourth shouldn't be all empty calories and covering your ears from the ka-boom. Just up I-5, the rugrats can learn about real American history on guided tours of this venerable Northwest outpost. Historical reenactments of significant events and black powder demonstrations should keep things lively, while a full day of music featuring the likes of the Strange Tones, Hit Machine, and Five Guys Named Moe will warm things up before Vancouver's own fiery festivities commence with the coming of darkness. Things are hopping in Hillsboro with the annual Rotary Parade featuring floats, marching bands, and civic leaders pelting the crowd with candy. 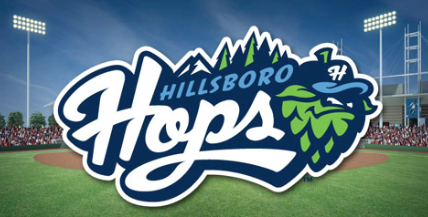 The parade's grand marshall is none other than the recently christened mascot of minor league baseball team the Hillsboro Hops, Boomer the Bear, who will undoubtedly remind everyone that the hometown Hops will host the Vancouver Canadians at 7 pm that night at Hillsboro Park. If you eat a hot dog during the game, no on will ever question your patriotism again. One fireworks display is pretty awesome, but two? Now that's a holiday! Pack up the Rav 4 on Wednesday and head to Silverton's breathtakingly beautiful Oregon Gardens, where there will be a full-tilt Fourth fest–one day early. In addition to music, food, and fireworks, the 80-plus acres of botanical bounty is an impressive display all on its on. Just 30 miles southwest of Portland, frontier fans can get an eyeful of calf-roping, bull riding, and bronco busting from cowboys and cowgirls who don't know the meaning of the word "fear." Barbecue, carnival rides, and fireworks complete the scene. If that's not incentive enough, there's also a Wild West art show. From the 7 am pancake breakfast to the fireworks at dusk, families can get the smalltown Fourth of July experience at the Corbett Fun Festival, a little over 20 miles to the east. A pie-eating contest, beef raffle, petting zoo, and the hotly contested slug races are on tap in the tent as well as the expected rides and fireworks. Why not spend the day in scenic Hood River? There's a parade in the morning, a fun run, the fire department's annual barbecue fundraiser, lots of kids' activities in Jackson Park, and fireworks at dark. Bonus: While the moppets frolic, parents can avail themselves of the many fine breweries in the vicinity, including Pfriem, Full Sail, Logsdon, and Double Mountain. The official Estacada Timber Festival runs July 4–6, with all sorts of lumberjack feats of daring-do, but the Fourth features the annual Chamber Parade (this year's theme is Timber! ), live music, fireworks, and the highly anticipated lawn mower races. Gather at the Eastbank Esplanade near the Hawthorne Bridge for a legit attempt at a watery world record for the longest floating human chain! 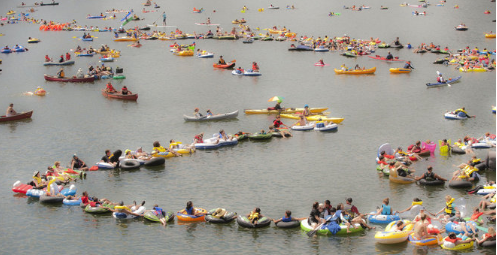 To be a part of this historic event it will cost you a measly $20 to cover the cost of life jackets and inner tubes, but you kind of need those unless you have an exceptionally buoyant personality.